Established in year 2009, Suriwong Marketing Sdn. Bhd. SRWM is supported by Suriwong Groups of Company (Suriwong Trading Sdn. Bhd. & Suriwong Fiber Sdn. Bhd.) with experience in trading of hardware and architectural products. Believing in the modern and innovative building material that will benefit the users and the environment, we insisted in offering good quality and environmental friendly product during our brands selections. We are working with responsible manufacturers to offer you trusted brands and supreme products’ quality. Our product ranging from fibre cement products, roof product, ironmongery and coating chemicals and MORE to come in future. Our energetic team made of products specialist equipped with strong product knowledge that participate in product specification and supervision during installation. The supports and synergies from our clients will further enhance the performance of the products. The strong believe in environmental friendly products has received recognition from our clients and suppliers who are willing to work together with us towards a greener future. 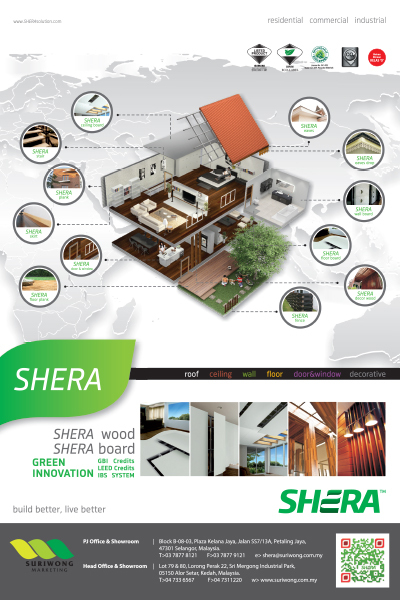 Our insistence and acceptance to green products has made us stand out among the building material trading businesses.